DIMITRI LASCARIS: This is Dimitri Lascaris for The Real News, reporting from Cascais, in Portugal. We’re beside the Al Awda, one of the vessels that make up the Freedom Flotilla. We’ll be departing tomorrow for our next destination in Cadiz, in Spain. And I’m here today with Bruno Dias, a member of the Communist Party, a member of parliament in Portugal. Thank you very much for joining us today. BRUNO DIAS: It’s a pleasure. Thank you for having me. So. DIMITRI LASCARIS: I understand that you are on a parliamentary committee, a friendship for Palestine committee. Could you tell me a little bit about that committee? BRUNO DIAS: When, when Palestine was recognized as a non-member observing state of the U.N. back in 2015, I think, we decided in the Portuguese parliament that it was time finally to create a friendship committee between the two countries and the two parliaments. So we have now this friendship committee, the Portuguese parliament with Palestine, which is one of the very few friendship groups that has, that have every single political party represented. So this is a site of diversity, but also a site of, of common solidarity, action, and positions with the Palestinian people and with the Palestinian parliament. And it’s an opportunity to raising awareness inside the parliament and outside the parliament about what’s happening in the Palestine, the suffering of the Palestinian people, the need to make steps forward on the solidarity action. And of course, in the political aspect of the recognition of the Palestinian state, and solidarity and friendship with the authorities and the representatives of the Palestinian people. 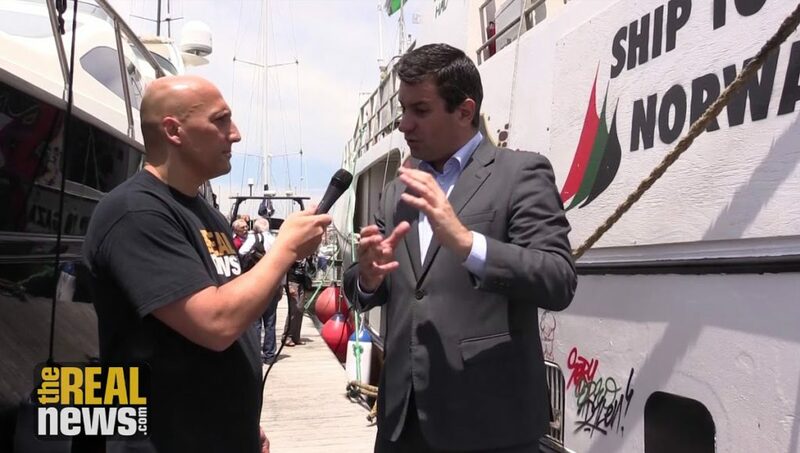 BRUNO DIAS: And so we knew that the Freedom Flotilla was here in Portugal, and of course our representation yesterday in Lisbon in the meeting with the Flotilla representatives and members. And today here meeting the crews and meeting the activists of human rights here in Cascais, it’s of course something that we wanted to do, and it’s a pleasure. DIMITRI LASCARIS: And it’s obviously taken a bit of your time to come down here and visit the vessels. Why do you feel that this particular expedition in this flotilla is so important? BRUNO DIAS: We are now in a time of great dangers for the Palestinian people. The suffering is taking all these years. Is for a very long time now. But these days the Palestinian people are facing new dangers and new menaces. And I think that every, every initiative that can help to raise awareness and to make the alert on what’s happening not only to Gaza, as a specific situation and particularly grave situation, but all of the Palestinian people, the diaspora, the biggest refugee community in the world. And yesterday was the day, the International Day of refugees. So we have to bring to the agenda everything that is happening to the Palestinian people. And of course these beautiful initiatives, this generosity, and humane and solidarity actions that crossing the seas, bringing hope, and bringing the solidarity words to the Palestinian people is of course something that we gain from it, with more hope, with more trust, with more strength to keep on our solidarity work. 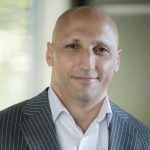 DIMITRI LASCARIS: And you know, the European Union, its policy towards Israel has been, one might say, somewhat contradictory. Because on the one hand it has consistently recognized that the settlements are a violation of the Fourth Geneva Convention. It recognizes that Israel routinely employs collective punishment, also a violation of the Fourth Geneva Convention, and a range of other human rights abuses. But at the same time it hasn’t taken the kind of concrete action that it’s taken against other human rights violators in the past. For example, the state of Iran. Do you think it’s time for the European Union, or at least the government of Portugal, to give serious consideration to economic sanctions on the state of Israel? BRUNO DIAS: There is a double standard, yes. We have already denounced that, the decision that was made possible by the Portuguese government back then was to recognize, for example, to recognize the Palestinian state in articulation with the European Union. We said we, as a sovereign state, must recognize this state of Palestine and the sovereign people that has the right to its own self-determination and independence. On the other hand, we are witnessing this passivity, and this somewhat complicity of the European Union with the, the attacks on human rights and the disrespect for international law that are taking place even now as we speak. So there is in fact a huge hypocrisy. And, and we have to keep on denouncing it. So we think that everything that, on human rights, on international law, on the United Nations, and of course setting, drawing a line to try to stop this double standard and this hypocrisy is something that really has to happen right away. DIMITRI LASCARIS: But may I take it that that means, in your view, that it is the time for at least some form of sanctions to be imposed in order to give teeth to international law when it comes to the state of Israel? BRUNO DIAS: I think that to get there we have a long way to, to walk. And right now that, the thing that bothers, and the perplexities that that I raise about this is if, for example, if Portugal defends a two-state solution but does not recognize two states, we have a long way to walk until we discuss the sanctions. So we are far back, and we have really huge steps to be taken, because right now the Palestinian people cannot wait for this indecision and double standards to keep happening. DIMITRI LASCARIS: Well, I want to thank you very much for joining us today, Mr. Diaz. It’s been a pleasure talking to you. BRUNO DIAS: Thank you for having me. It was a pleasure, also, and good work. DIMITRI LASCARIS: Thank you. And this is Dimitri Lascaris reporting for The Real News from Cascais, in Portugal.